Every day in America, nearly 3,000 preborn children are killed by abortion. The Guttmacher Institute, a former research arm of Planned Parenthood, records that there are an estimated 1.06 million abortions in a year in the United States— one every 30 seconds. In the following videos, Dr. Anthony Levatino, a practicing OB/GYN who performed over 1,200 abortions in the early part of his career, describes the four most prevalent abortion procedures in the United States. More information about these procedures can be found at AbortionProcedures.com. 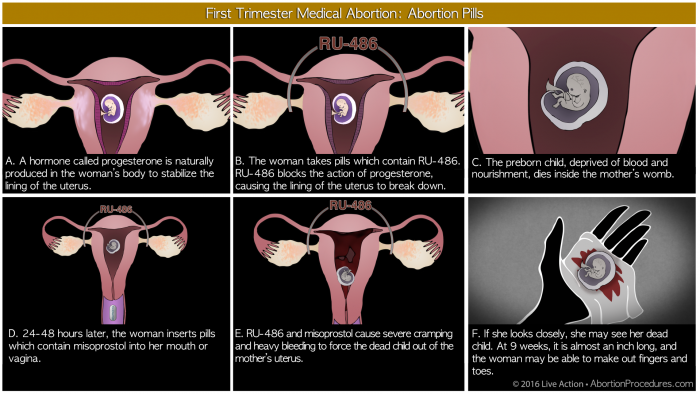 Medical abortions occur in the first trimester, after a women ingests pills containing Mifepristone (RU-486) and Misoprostol. The drugs are FDA approved up to seven weeks LMP, although it is sometimes prescribed off-label up to nine or 10 weeks LMP. According to the Guttmacher Institute, medical abortion accounts for 36 percent of abortions before nine weeks’ gestation, in 2011, or an estimated 240,790. Medical abortions increased from 6 percent of all abortions in 2001 to 23 percent in 2011, while the overall number of abortions declined over the years. Planned Parenthood and the abortion industry have been pushing the abortion pill, which requires no direct medical supervision, as the new wave of the future. 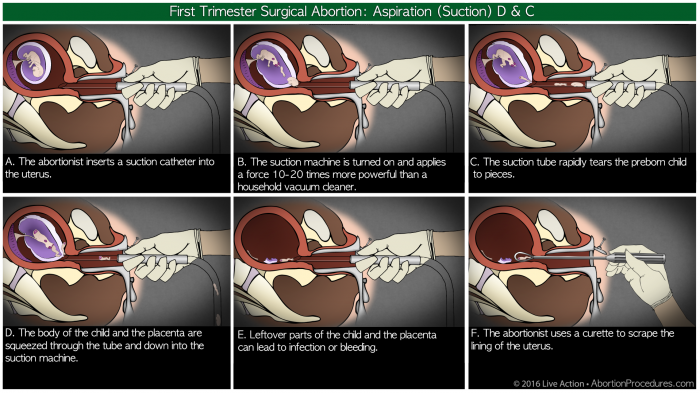 The aspiration abortion procedure, also known as suction D&C, is the most prevalent abortion procedure in America. In the procedure, a suction catheter is inserted into the mother’s uterus, and a suction machine with the force 10-20 times stronger than a household vacuum is turned on. The preborn child, whose body is tiny and fragile, is violently torn apart by the force. Based on data from Guttmacher, approximately 700,000 preborn children are killed every year through this procedure —nearly 2,000 every day. Guttmacher reports that 88.8 percent of abortions occur in the first 12 weeks of pregnancy, which account to 941,280 abortions every year. 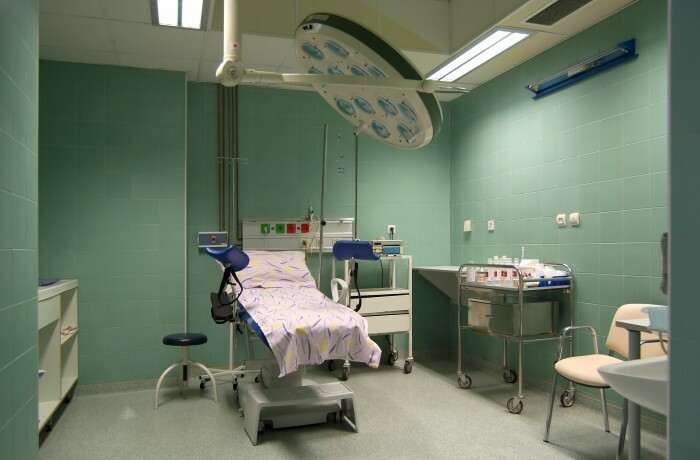 A D&E abortion, or dilation and evacuation, is performed from 13-24 weeks of pregnancy, and is the most prevalent abortion method used in this time frame. 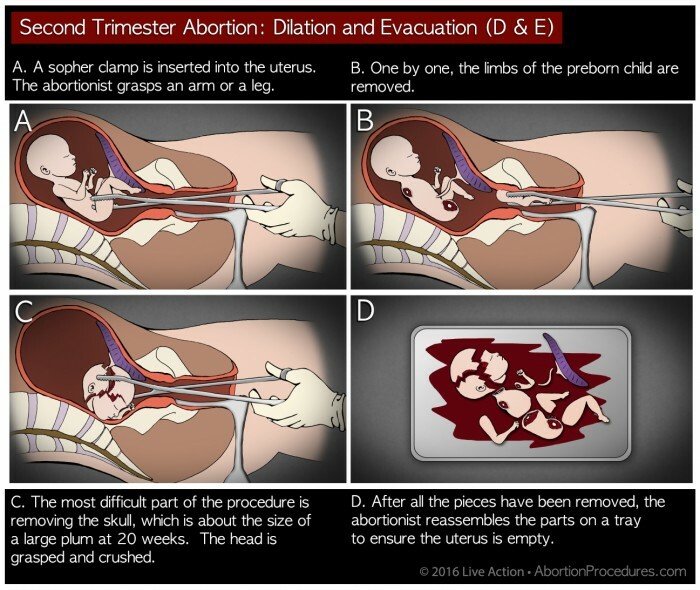 The abortionist uses a sopher clamp to dismember the preborn child limb from torso in utero, and then finishes the abortion by using a curette to scrape the uterus for any remaining pieces. Guttmacher reports that over 25 percent of abortions in the United States are committed between 9-12 weeks of pregnancy, although D&E abortions are also committed up to 24 weeks. Abortions after 21 weeks only account for 1.2 percent of total abortions. D&E abortions total at least 10 percent (a minimum of 100,000) of abortions in the United States every year. 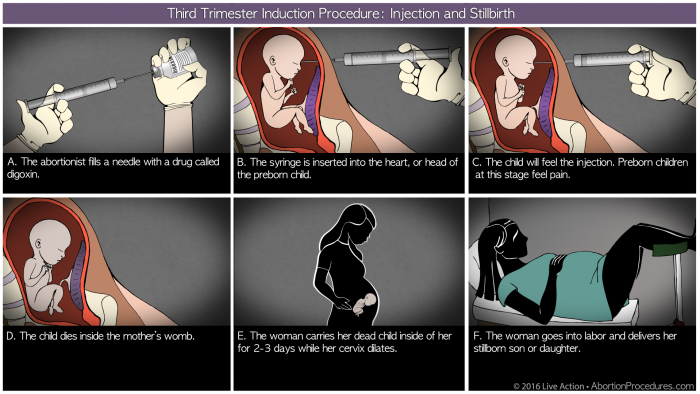 An induction abortion is performed at 25 weeks LMP to term. This abortionist injects a substance into the preborn child to cause cardiac arrest, and then induces labor over a period of two to three days. During this time, the woman will carry her dead baby inside her as she gets ready to deliver the child. Abortions in the very late-term (after 21 weeks) account for 1.2 percent of total abortions in the United States. Science affirms that the child at this stage of pregnancy is developed and can feel pain.